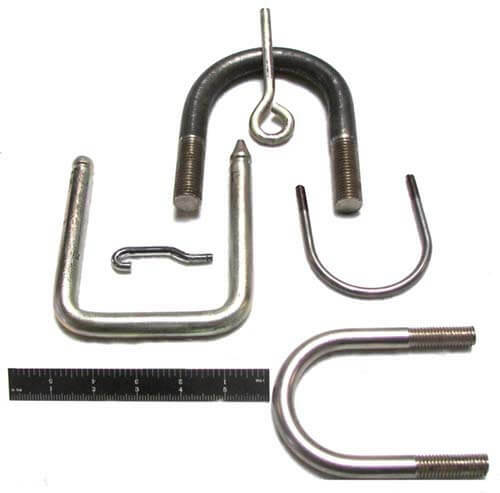 Archer Engineering manufacturer’s custom bolts including hex bolts, square bolts, and round bolts. Occasionally security is a concern, so tamper-proof designs may be utilized. Examples of tamper-proof may include one-way heads, break off heads, pentagon shape and recessed internal features. We manufacture bolts designed to hold parts together in sizes ranging from ¼” to 4” diameters. Bolts are used to hold parts that are stationary or moving Bolts may look common but requirements may determine the material, strength and tolerances. Common industries that require specialized and industrial bolts are agriculture, automotive, military, food processing, marine and scrap processing. The selection of the material is based on application. Considerations are strength, weight, corrosion resistance, chemical resistance and high temperature requirements. If the material selection is steel a common guide would be standard bolting material, low carbon steel, medium carbon steel and alloy steel. In addition, mechanical properties can be increased by heat treating. If weight is important, aluminum is a good choice. Titanium is known for a light weight and strong material. For corrosion and chemical resistance a variety of stainless steels are available including stainless steel 304, 316, and 347. High temperature applications could use some grades of stainless steel and exotic materials. Depending on your project or application we carry a broad material base and coatings to extend the life of the bolt. Bolts can be manufactured complete or by modifying a standard. Industry standards have been established and documented to provide guide lines for manufacturing and inspection. Archer Engineering follow the SAE (Society of Automotive Engineers), ASTM (American Society of Testing Materials), IFI (Industrial Fastener Institute), ASME (American Society of Mechanical Engineers), and Mil-Std (military standards).